Lo, the week speaketh, nor can be gainsaid! 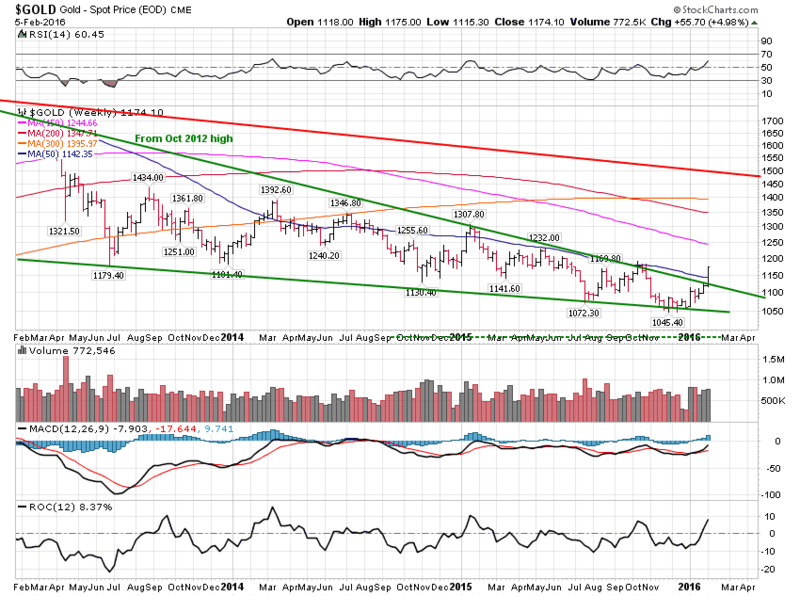 The SILVER and GOLD PRICE rose strongly, while stocks and the dollar took bullets from every side. Note also gains in platinum and palladium, reinforcing and confirming silver and gold prices. Dow in gold and Dow in silver both sank more than 5%. 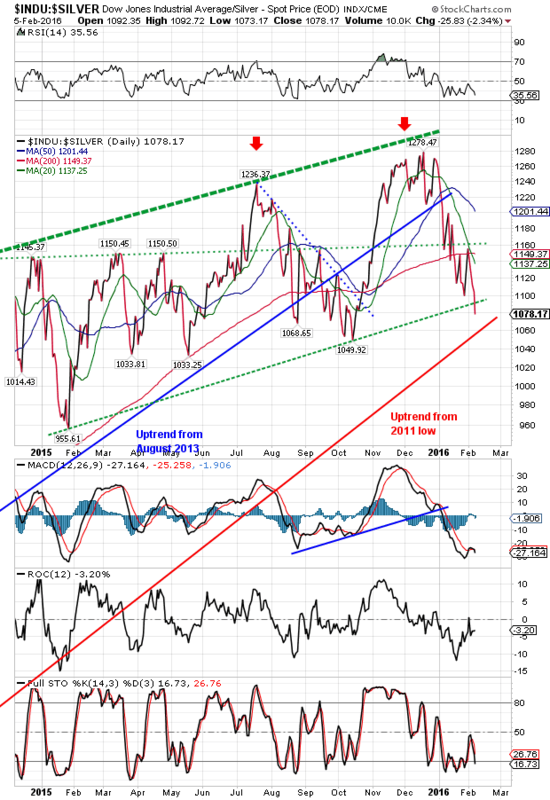 Dow/metals trend has turned decisively down. On Comex today where mercy is neither shown nor asked, silver dropped 7.2¢ to close at $14.764. The GOLD PRICE added twenty cents (20, count ’em) to $1,157.80. HOGWASH! Hogwash! In the aftermarket the gold price popped up $15.50 (1.3%) to $1,173.30. Silver popped 26.6¢ (1.8%) to — LOOOKY HERE! — $15.03. There more, even better, but I’m saving it for later. Daily chart makes me say HOGWASH. Right at 9:00 a.m. the price of gold gapped from $1,160 to $1,151. That’s on a ONE minute chart. 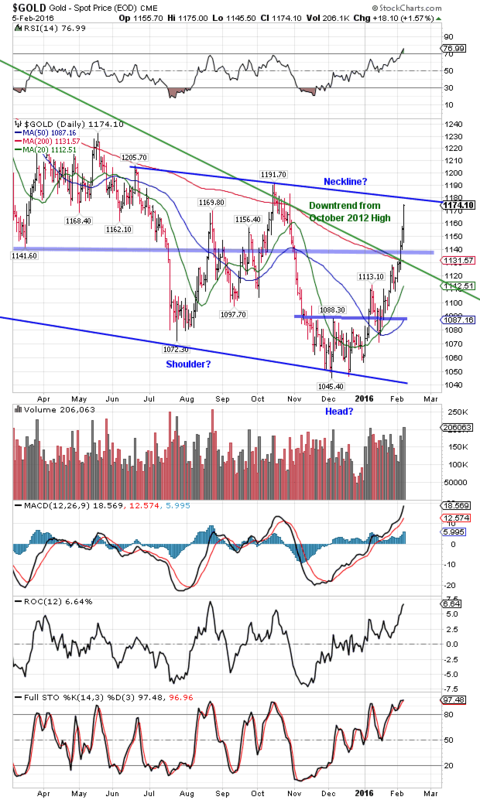 It eased down to $1,145, made a rounding bottom, and then right about when Comex closed, jumped, leapt from $1,150 to $1,157.50, traded sideways a while, then shot up. The old slap-her-down-with-massive-selling aren’t working anymore. SILVER behaved much the same. 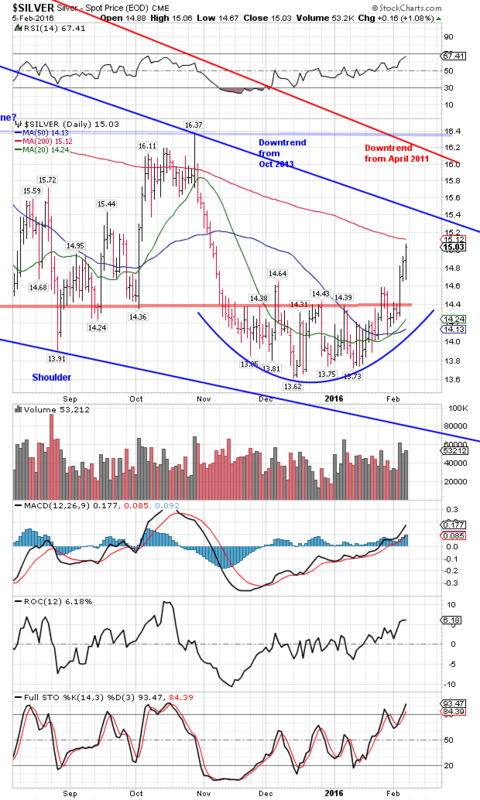 Gapped down at 9:00 a.m. from $14.90 to $14.80, made a rounding bottom, then started climbing after Comex closed. On the right the weekly gold price chart since 2013. Carefully mark that this week gold broke upwards through the downtrend line from the October 2012 high and poked its head way above the 50 week MA ($1,142.35). Weekly chart breakout confirms the daily chart breakout. Monthly does not yet show it, but that comes next. On silver’s weekly chart there’s a big bullish falling wedge, and silver barely peeked through the downtrend line this week. Didn’t make it through the 50 Week MA. Chart on the left. What’s next? Here is one possibility, and only a possibility. 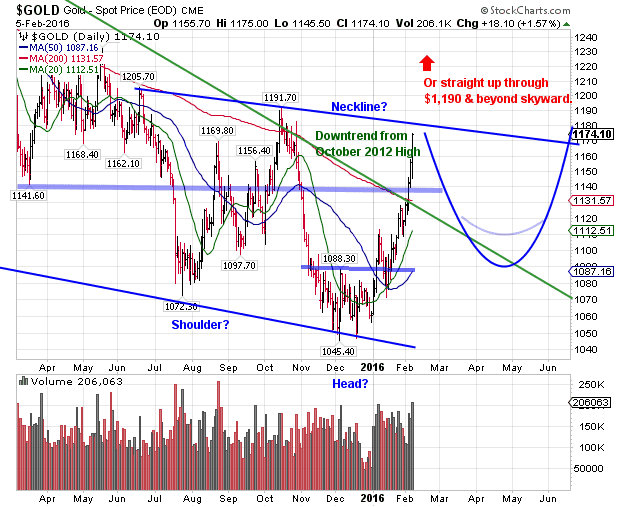 First look at the chart on the right, Between July and October gold traced what looks like a left shoulder of an upside-down head and shoulder pattern. Then it fell back to sketch out a big head with the bottom in December. Now it is outlining the right side of that head up to some Neckline, maybe about $1,175. From there it might back off and paint a right shoulder, backing up to $1,140, $1,125, or even $1,090. After terrorizing and shaking off as many gold buyers as possible, the bull would then turn up and rally through that neckline, never to return. OR, when it reaches $1,190, it might just punch clean through and never look back. 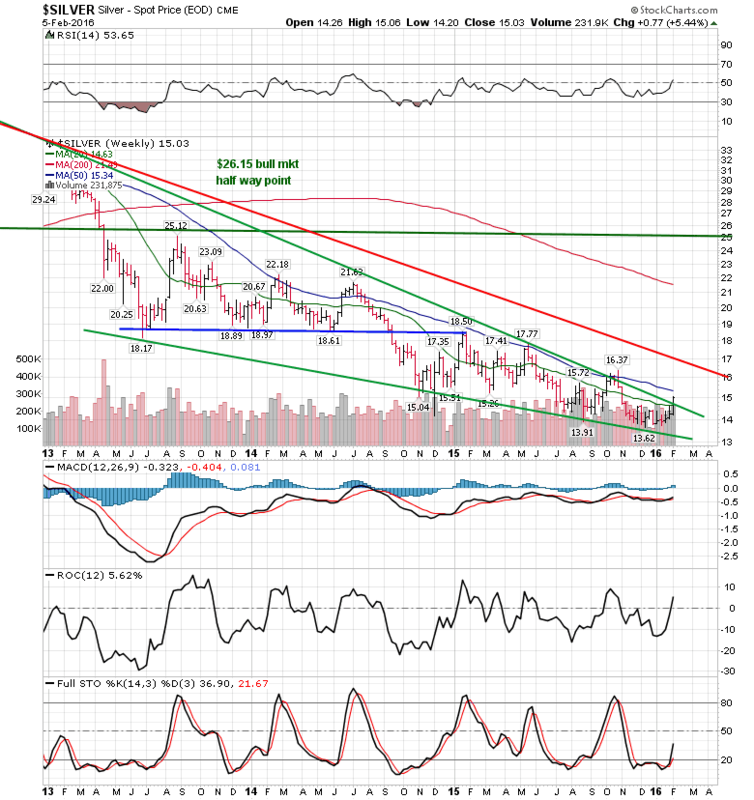 I can’t make up my mind which, but either way the silver and gold price bottomed back in December. Stocks continue to spring bad surprises and unexpected disappointments. So far their way has been blocked at 16,600 and 1,950, as some fool guessed. Dow fell from the opening, down, down, down, then down some more. Ended 211.61 (1.29%) lower at 16,204.97. S&P500 ended 35.4 (1.85%) cheaper at 1,880.05. It begins to appear that stocks lack sufficient gumption even to mount a convincing countertrend rally. Y’all ought to be selling stocks and buying silver and gold with the proceeds. Dow in silver dropped 25.83 ounces today to end at 1,078.17. If it drops 24 more ounces, it will smash at 1,054 oz the uptrend line from the 2011 low. Do y’all understand this means the END of the bear market in silver and gold, and the end of the bull market in stocks? US dollar index dead-cat-bounced 52 basis points (0.54%) to 97.01, just above the 200 DMA at 96.89. Looks broke as a stopped government clock to me. 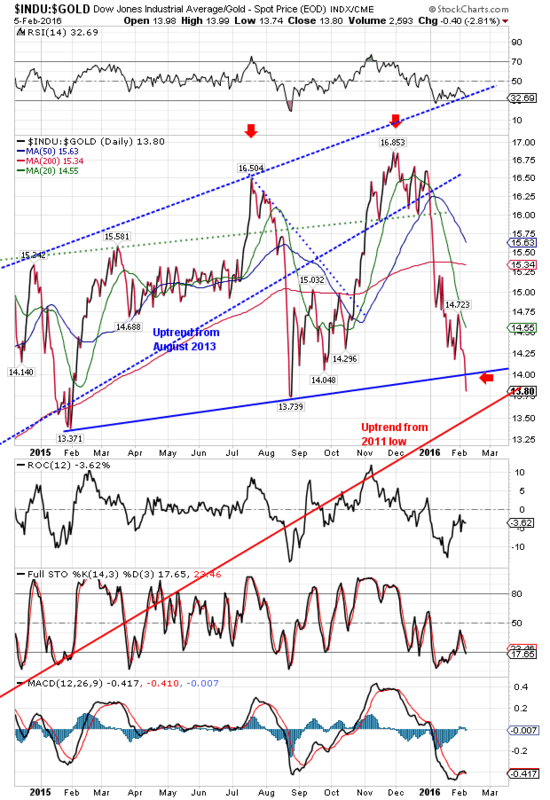 Closes below 96 confirm brokenness, below 95.5 plumb-brokenness, below 92.50 slap-out-brokenness. Euro shot up Wednesday, gapped up yesterday, and backed off today 0.38% to $1.116.0 Above the 200 DMA and all others, so rallying. Might reach $1.1500. Yen must be chafing the Japanese Nice Government Men something fierce. They thought they’d fixed it good, driving it down with the surprise Negative interest rate announcement, but the dollar’s dive this week sent it shooting up to HIGHER prices than before their manipulation. Today lost 0.03% to 85.58. Please accept my heartfelt thanks for your continuing prayers for Susan’s eye. It is healing slowly but she is still suffering much pain.